John Carpenter and Debra Hill wrote those words for the screenplay of 1978’s Halloween. 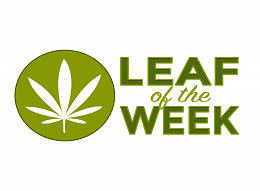 The idea came from a college field trip Carpenter took to a Kentucky mental institution. A boy was there, perhaps 12 or 13 years old, and Carpenter was struck by his “schizophrenic stare.” Now, I know that’s not exactly woke these days, and anecdotes like that reinforce the stereotype of the mentally ill being a bunch of rampaging monsters. On the other hand? We can’t control what scares us, and that kid sure made an impression on Carpenter. That kid was the engine in Carpenter’s psyche that created the original Halloween, one of the most ruthlessly effective horror movies ever made. For a good chunk of time, it was the most financially lucrative independent film ever made. Its budget was a mere $300,000, and it made $47 million during its theatrical run. That trainload of money meant only one thing. Sequels! Lots of them! There have been 11 films in the Halloween franchise. They are, by and large, terrible. In 2007 and 2009, Rob Zombie gave a hillbilly horror spin to a reboot and a sequel. They’re aggressively unpleasant films, but I give Zombie credit for sticking with his vision. What all of that tells us is that Halloween never needed a sequel. 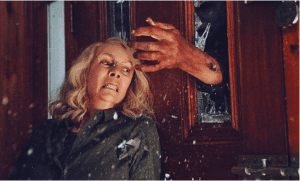 The eleventh film in the franchise — the somewhat confusingly titled Halloween — is in theaters now, and it’s the first sequel that justifies its existence. Wisely, this film ignores the rampant foolishness that took place in all the other films and treats them like they don’t exist. 40 years have passed after the events of the first film, and we begin with dippy podcasters Aaron Korey (Jefferson Hall) and Dana Haines (Rhian Rees) arriving at Smith’s Grove Sanitarium. They’re making a documentary about legendary lunatic Michael Myers (James Jude Courtney and Nick Castle). Michael is currently under the treatment, if you can call it that, of Dr. Sartain (Haluk Bilginer). The good doctor informs Aaron and Dana that Michael hasn’t spoken in 40 years. He can, he just chooses not to. Our preposterous podcasters believe they can understand the essence of Michael, which is a very particular kind of liberal stupidity that I thoroughly enjoyed. They try mightily to get Michael to say something and even goad him by showing him his original Captain Kirk mask. Michael doesn’t respond — at least, not in any way we recognize. From there, Dana and Aaron continue to display poor judgment. They visit the home of Laurie Strode (Jamie Lee Curtis), the survivor of the Myers rampage, and offer her three thousand dollars to talk to them. Laurie isn’t exactly what you’d call a happy camper these days, considering she lives in a heavily fortified compound positively brimming with weaponry. Her PTSD is severe but she’s canny enough to tell the podcasters that there’s nothing to understand about Michael, he’s simply evil, then kick them the hell out. I think it’s important to make the distinction that, while I love horror movies, I usually don’t care for slasher movies. Too often, they’re formulaic and they substitute gore for real scares. That’s why I usually prefer something more meta like Scream or Behind the Mask: The Rise of Leslie Vernon. Credit must be given to the 1978 Halloween for doing nearly everything right. That movie feels like autumn, with dead leaves and nights that are a little darker than what you’re used to. The 2018 Halloween doesn’t quite have the same feeling of mounting dread and runaway train pacing as the original, but it remains skillfully made. Director David Gordon Green is mostly known for perceptive arthouse dramas like the very good George Washington, and stoner comedies like Pineapple Express. The hallmark of a Green film is small character moments, and we have that here. The scares are okay, the gore is okay, and the body count is bigger than the first film. Green’s pacing is solid, but he takes the time to make us care about these characters. We like Laurie and her family, and they aren’t just annoying fodder for Michael to fold, spindle, mangle, and mutilate. More importantly, the script by Green, Danny McBride, and Jeff Fradley, has interesting things to say about trauma, specifically the idea that your trauma doesn’t care about you. In a lesser film, Michael would return to terrorize Laurie and specifically focus on her. Here, it’s implied that Michael is the same kind of destructive and impersonal force as a hurricane, and despite the decades Laurie has spent thinking about him, he’s given precisely zero thought to her. * It’s also not saying much that this is the funniest Halloween sequel, but I must admit I got some hearty chuckles. Let’s take a minute to talk about the approach to Michael Myers himself. Remember the old story about the blind men and the elephant, and each of them touches a different part of the elephant and reaches a different conclusion? 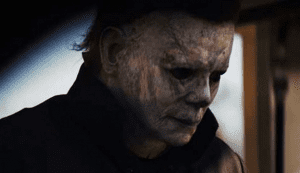 Green’s approach is that Michael Myers is ultimately an unknowable force, and that blank mask exists as a way for others to project their opinions onto it. The dingbat podcasters believe he and Laurie exist in a metaphysical pairing. Dr. Sartain has looked into the abyss of Michael and thinks he has the key to unlocking the nature of evil. Laurie thinks that the night of Halloween, 1978, was something that happened to her personally, instead of a random event. ** What’s the truth? All we know is the blankness of that mask and constant forward momentum. Ordinarily, the casts of horror movies are either inexperienced amateurs or has-beens chasing a paycheck. They range from “I don’t know what I’m doing, HELP!” to “I don’t care what I’m doing, where’s craft services?” Green’s cast is a good one, and there are a couple of standouts. Judy Greer is an actor with serious talent, and her voice work as the insane Cheryl in Archer is better than we deserve. However, Hollywood never knew what to do with her and saw fit to cast her as a nagging ex-wife in Ant-Man, and as a nagging ex-wife in Jurassic World. As Karen, she’s finally given a chance to play an interesting character desperately trying to live a normal life and put the past behind her. 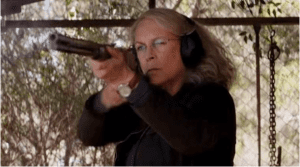 Speaking of which, Jamie Lee Curtis’ Laurie Strode has totally defined herself by the events of a single night. This goes beyond her firearms training and the fortification of her home. There’s a reason her closet doors look just like the closet she originally hid in. She’s become totally fixated on Michael Myers, and she’s convinced that he’ll eventually come for her. *** She puts Michael Myers before her two ex-husbands, before her daughter, and before her granddaughter Allyson who loves Laurie desperately but can’t figure out how to heal the family. Curtis is such a skilled actor, and she gives a disciplined performance here. Her acting alone is reason to see this film. There have been eleven Halloween sequels. If you absolutely have to have a sequel, you really only need this one. It echoes lines, shots, and themes from the original, and it puts a definitive period at the end of a couple of character’s stories. This film has also made more than $70 million dollars so far. My gut tells me we’ll see Michael Myers again, and that’s a shame. There are other monsters. *Though one interesting concept that Green takes from the original is that Michael Myers is using murder as a means of communication. We never find out exactly what he’s trying to say, which is a smart move. **It’s the idea that bad things happen alongside us as opposed to happening to us. Pretty deep stuff for a slasher movie, huh? ***Though this movie gives me the impression that if Laurie had moved to New Mexico and opened up a gem shop, Michael never would have given her a second thought.